Automated structure verification is becoming more widely utilized to quickly reject incorrect structures prior to submission to company compound repositories and biological assays. Recently, automated structure verification has been implemented in the discovery chemistry space at Merck as a stage gate for compounds prior to their submission for assays. For compounds synthesized as singletons, the verification relies on proton and (1H13C)HSQC results; however, compounds resulting from library format syntheses are verified based solely on proton spectra due to constraints of minimal sample availability and the current detection limits of the system used for library sample analysis. Results from using automated structure verification in both paradigms will be presented. The problems associated with samples resulting from actual lead optimization compounds rather than purchased building blocks—for example, purity concerns, concentration, rotamer issues, regiochemistry, and complexity—will be discussed. |Automated structure verification is becoming more widely utilized to quickly reject incorrect structures prior to submission to company compound repositories and biological assays. 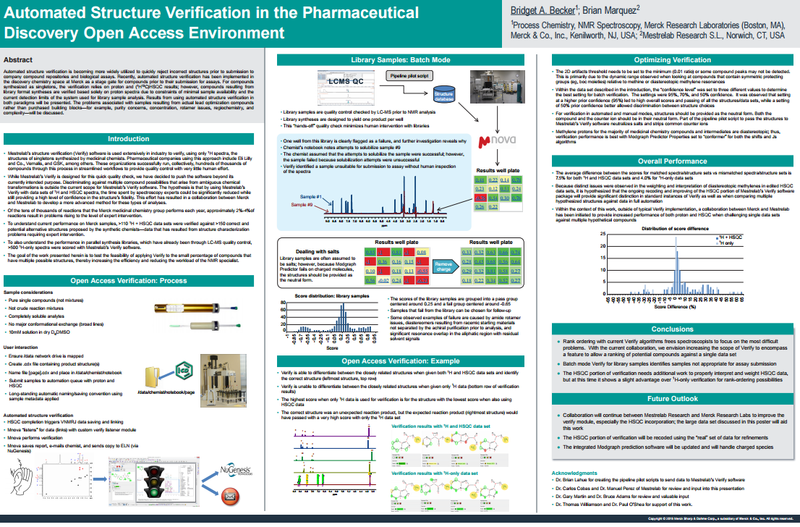 Recently, automated structure verification has been implemented in the discovery chemistry space at Merck as a stage gate for compounds prior to their submission for assays. Previous ArticleSMA coupled to PCA: Let’s do it!